The third step in creating a stacking plan is creating suites within each of the floors you have created. When you created your floors, you had the opportunity to enter the number of suites for the floor. This, you should see auto-created suites associated with your floor. 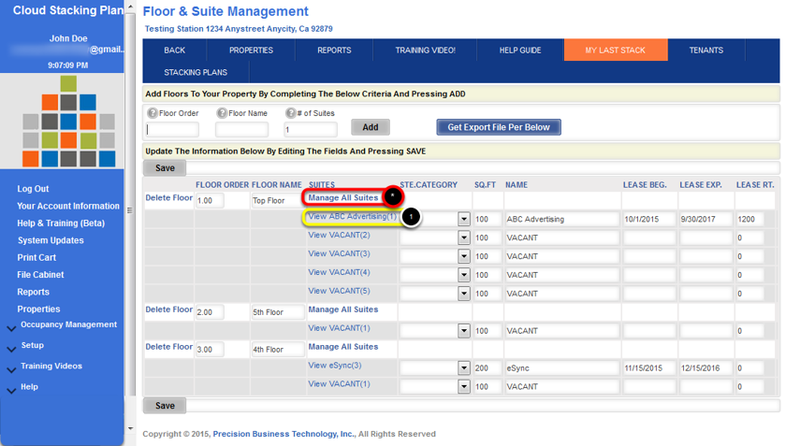 You can either click on one of these suites or you can choose View All Suites, which then you will be directed to a page where you will be able to create and manage suite data for the floor you have chosen. Within Suite Detail, you will see 2 drop-down lists. The first is a list of all of your floors, where your will see that the floor you originated from is chosen. In the second drop-down you will see a list of suites for the chosen floor. Once you have your desired suite chosen, go ahead and edit the information for this suite, then press Save. Repeat this process for all of the suites on this floor, as well as all of the floors for your property. Data Elements - data elements at the suite detail level are mostly self-explanatory. if there is a data element you would like to see us include in this list that we do not already, please send us a message through our "Contact-Us" page. Select Floors & Suites for the property you are working on. Select the Suite you would like to edit. * Alternatively, you can choose Manage All Suites, which then you will be directed to a page where you will be able to create and manage suite data for the floor you have chosen. 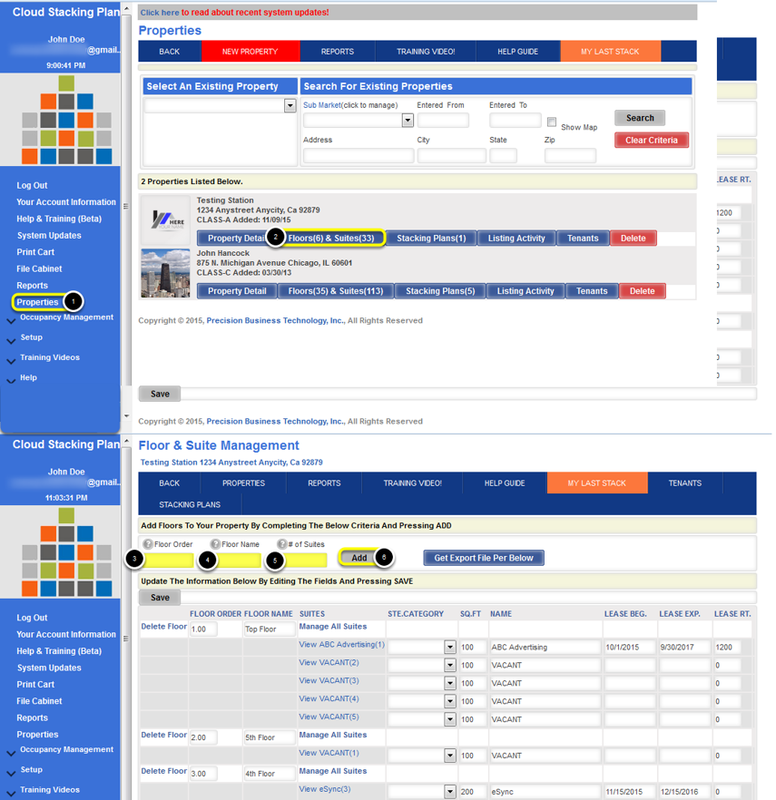 Verify Proper Floor or Select a different Floor from the drop-down list. 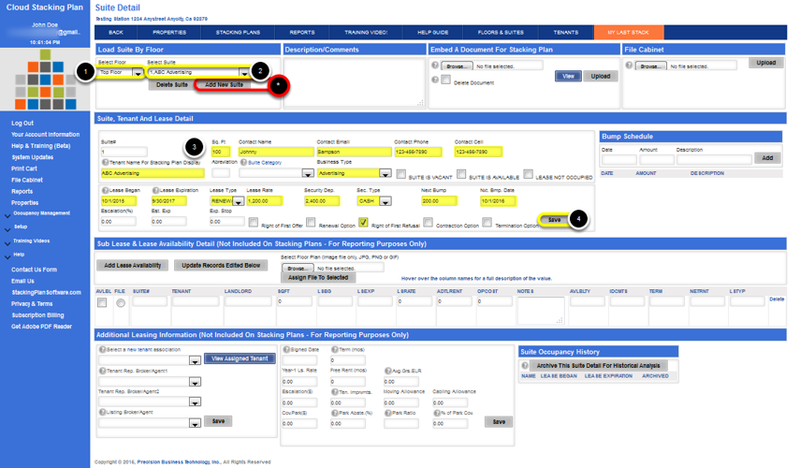 Verify Proper Suite or Select a different Suite from the drop-down list of suites for the chosen floor.